View of Rogers Centre and CN Tower from the Toronto harbor. My husband needed to take some time off or risk losing it, so we decided to give our passports a little work out and head to our neighbors up north last week. First stop: Niagara Falls (Canadian side). I hadn’t been to the Falls since I was eight, so I was excited to see them again as an adult. They were even more impressive than I remembered. We took the Maid of the Mist boat tour for an up-close—and very wet!—look to get a good feel for the size and power of both American Falls (U.S.) and Horseshoe Falls (Canada). Next up: Toronto. I didn’t know what to expect from Toronto. When it comes to big cities, we’re always looking for what makes it different from any other big city in North America. In Toronto, we found a modern, friendly, relatively clean metropolis with incredible ethnic diversity. Apparently half of Toronto’s population was born outside of Candada! We could have taken the subway, but instead we walked nearly everywhere. Our hotel was close to Dundas Square (say “Dun-dass”), the city’s version of Times Square, as well as the LGBT-friendly neighborhood of Church Wellesley Village, which had a great selection of shops and restaurants. In fact we ate dinner in Church Wellesley two of our three nights there. The area—and in fact the entire city—was decked out with pride flags and banners in anticipation of last weekend’s Pride Parade. 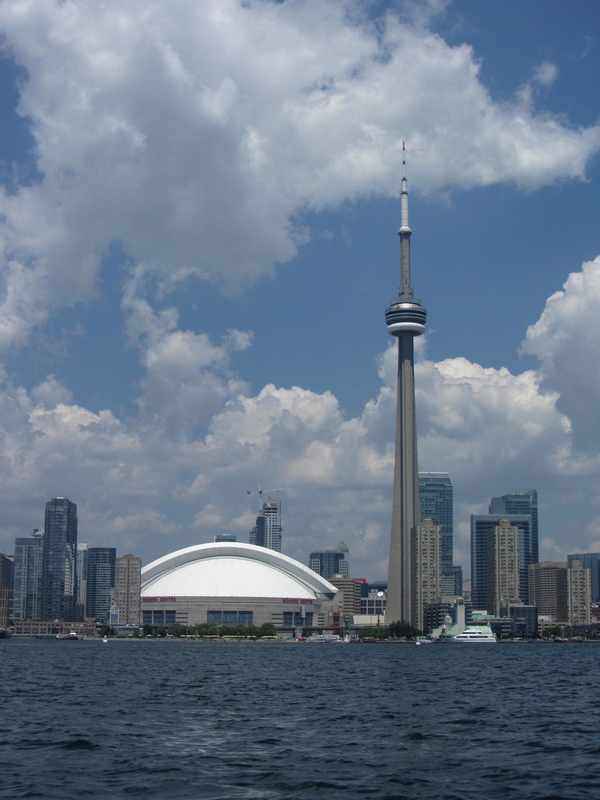 Toronto is located on Lake Ontario, and we got a great view of the outlying islands and the city landscape from CN Tower, the tallest tower—and second tallest building—in the world. We lunched in St. Lawrence Market, an indoor market of individual restaurants and shops selling organic produce, meat, cheeses, and plenty of kitschy items. On our last day in town, we took a bus tour. It’s something we often do in new-to-us cities to pick up on the local flavor and history, and get an overview of the place. This one came with a fabulous boat tour of the harbor and Toronto Islands. Toronto is a city under construction with many high-rise condominium buildings going up near the water, and work being done to expand Union Station (which supports both subway and train). I can’t say I blame people for flocking to this city by the bay. Glad you enjoyed it, eh? Maura: You should definitely go to Toronto if you have a chance. It’s only 90 minutes north of Niagara and worth it. Thanks!